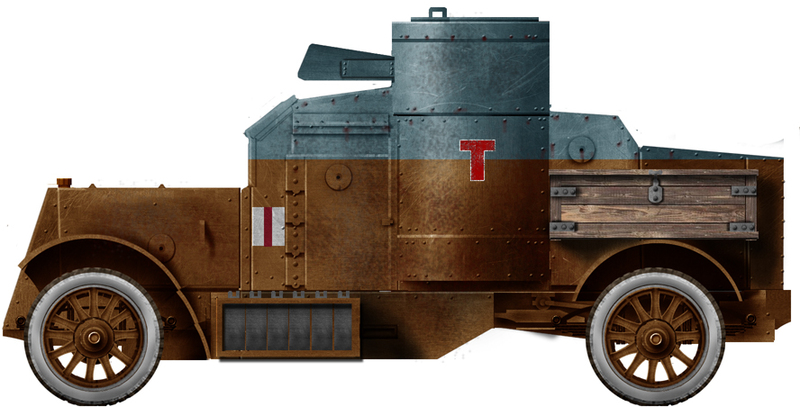 The Anglo-Russian Austin armored car is one of the most successful and prolific vehicles used in of World War I. It was operated primarily by the Russian Empire. Two Russian models were also built locally by Putilov. 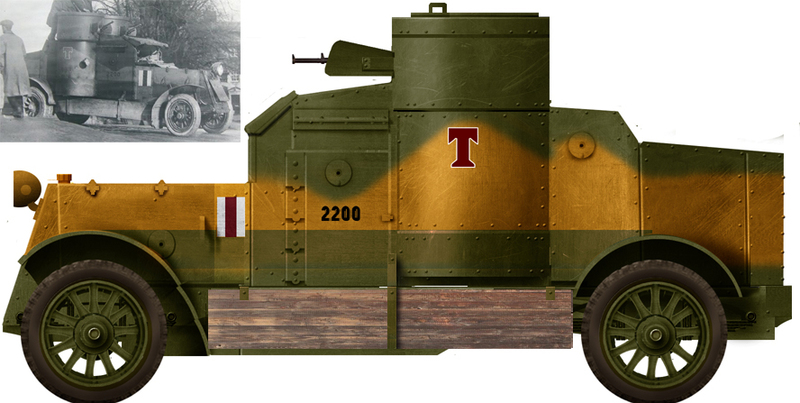 The development of this armored car was jump started by a Russian committee which came to Great Britain to purchase local armored cars, specifically one with good overhead protection and two machine gun turrets. The Austin Motor Company quickly produced a demonstrator to meet these requirements. 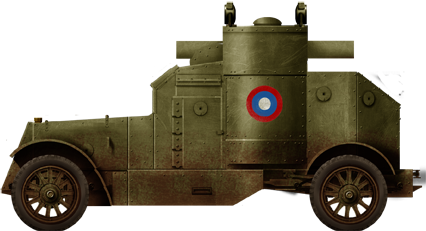 This model was accepted into service as the Austin Armoured Car on 29 September 1914. The Russian government ordered 48 vehicles at a cost of 1,150 pounds apiece (equivalent to about 122,000 pounds in 2017 money). It was based on the Austin 30 hp, rear-wheel drive chassis. For battlefield operations the wooden spoke wheels could be switched out for solid rubber tires. 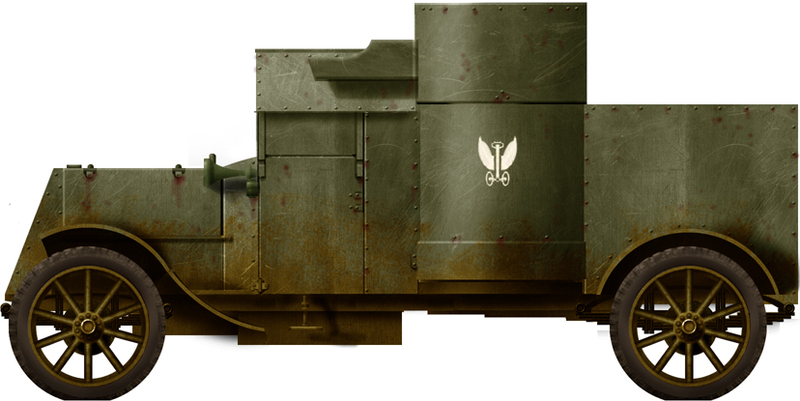 Additionally, two Maxim machine gun turrets were mounted above and behind the driver’s cab. Each turret could cover the entire side hemisphere of the vehicle on its respective side, their fire overlapping front and rear. The body was made from 3.54 mm (0.14 in) thick armor plates bolted to a frame over the chassis. Crew consisted of four men, a commander, driver, and two machine gunners. The crew could enter the vehicle through a door on the left side or a two-leaf door in the rear. Upon their arrival at Izhorski Works in Russia the Austin armored cars had their 3.54 mm armor plates replaced with 7 mm (0.28 in) thick plates. This made them much heavier, stressing the axles and engine and reducing their speed and agility. However the Russians were quite satisfied with this improved model and asked for their changes to be incorporated into a new series. Some damaged Austins were rebuilt on White armored car chassis. On 6 March, 1915 a new series was ordered with improved armor. This time, a stronger 1.5 ton truck chassis and more powerful, 50 hp, engine were chosen in order to cope with the burden of extra weight. The cab roof was modified to allow a better arc of fire for the turrets. To strengthen the rear section the rear doors were eliminated, much to the dismay of Russian officers, who quite liked this feature. The rear hatch was added back when the 60 vehicles arrived in Russia. In addition a rear driving post was added, as well as additional shielding for the machine guns. A third series was ordered on 25 August 1916. 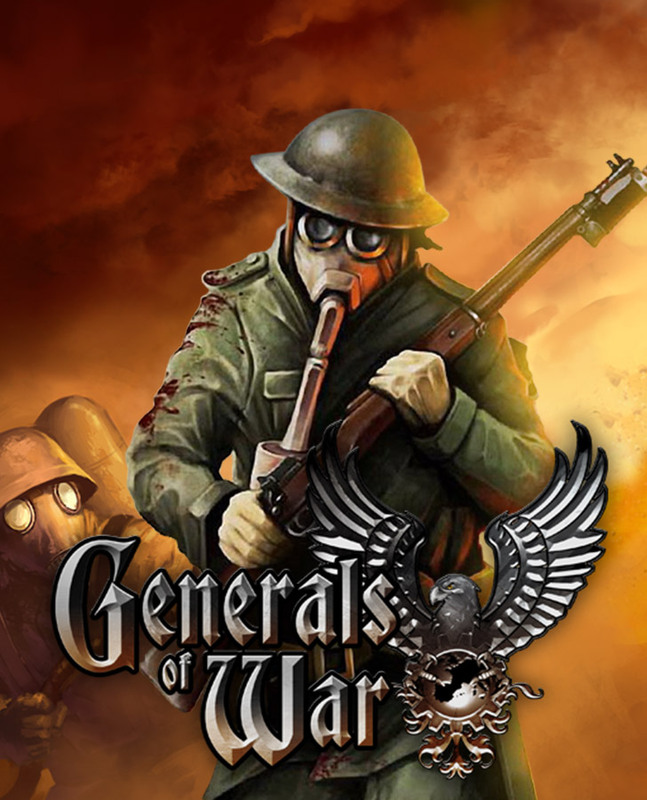 This series incorporated experience gained in wartime operation. The rear hull was modified with a driving post and side machine gun shields. Bulletproof glass replaced the front vision slots and the side windows were eliminated. By the fall of 1917, a fourth series was ordered with a reinforced chassis and double rear wheels. 16 cars of this series were built, called the 1918 Pattern. However political events prevented this last batch of cars from being delivered to Russia. Instead the British Army took ownership of the 1918 Pattern cars, these were on the only Austins operated by the British. 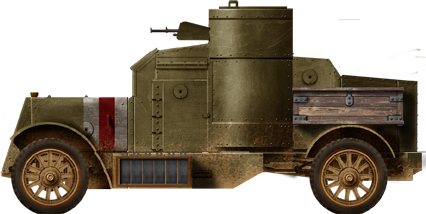 The bodies of the 1918 Pattern cars would later be reused on the Peerless armored lorries after the War. 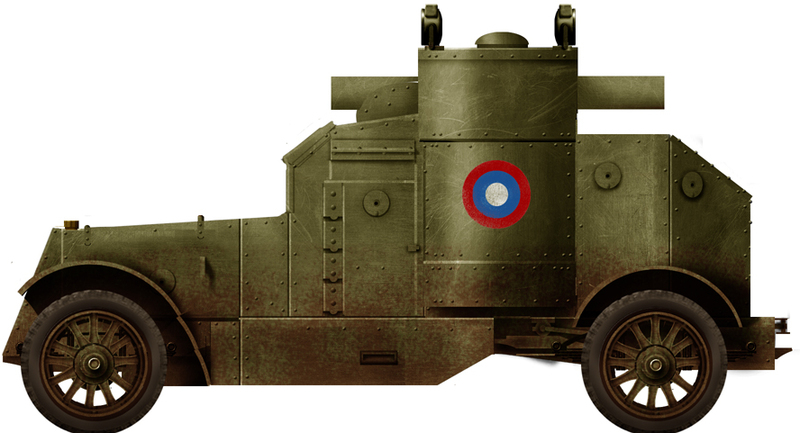 The Austin armored car remained in service from 1914 until 1939 – a whopping 25 years. The first operator of Austins, Russia, organized them in automobile machine gun platoons modeled after early war experience. The lead platoons comprised three Austins, four staff cars, three support trucks (workshop and tanker) and four motorcycles, with a complement of 46 soldiers. Regular platoons had only two Austins and a Putilov-Garford for artillery support, a staff car, a truck, and a motorcycle. 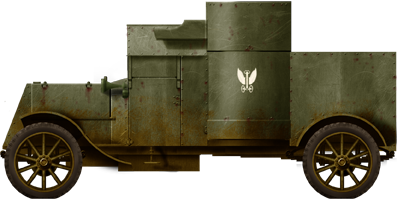 In August 1916 these units were reorganized into more sizable forces called Armored Automobile Battalions; each attached to an army and formed from two to five platoons. During the Russian Civil War, Austins were used by both sides. The Red Army had the majority of the Austins (and most Putilovs) and organized them into “armored automobile units” of similar strength to a lead platoon. 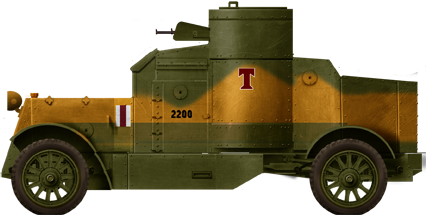 Austin armored cars were deployed to the border during the Polish–Soviet War, leading to some being captured. 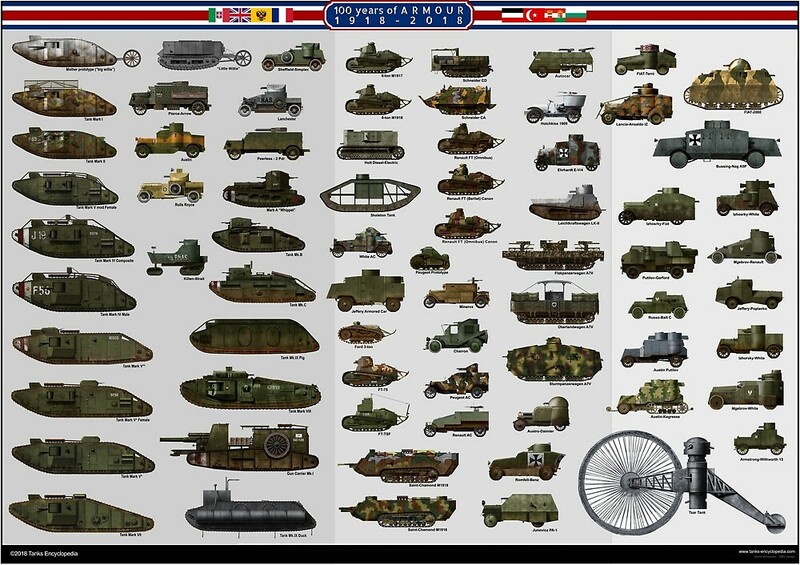 The British-built vehicles were kept in service until 1931, and the Russian-built Putilovs until 1933. The last batch of Austins (1918 Pattern) were exclusively used by the 17th (Armoured Car) Battalion of the British Tank Corps. This unit was active in France from March 1918 until the German surrender. These vehicles distinguished themselves at the Battle of Amiens, capturing a German headquarters 10 miles (16 km) into enemy territory and creating havoc within reserve and support units. This was also the first unit to cross the Rhine. Other Austins were deployed to the Far East and Caspian Sea region. Some were stationed in Ireland. Their bodies were reused on Peerless lorry chassis and kept in service until 1939. In 1919, four Austins, two Series II and two Series III, were taken into service with the Kokampf unit of the German Freikorps. Austin Armoured Car Series I in Russian service. Austin Armoured Car Series II in Russian service. Austin Armoured Car Series III in the famous 1916 bi-tone livery, Russia. Austin Armoured Car Series III in British service, 1916. Austin Armoured Car 1918 Pattern in British service, RIC Barracks at Ennis, Country Clare, Ireland, November 1919. 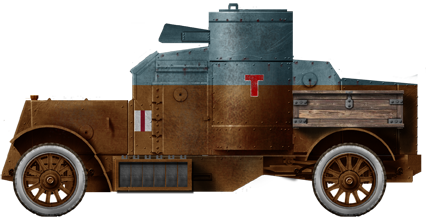 Polish White-Austin armored car “Mars”, 1920.